Everyone knows the "wiener dog," or dachshund, the low-riding dog with short legs and long body. The miniature dachshund stands a whopping 6 inches at the shoulder and weighs up to 11 pounds. His unique build is an asset if he hunts, allowing him to burrow and catch prey in underground tunnels, however it makes him prone to obesity if you don't watch his diet and exercise. Going back to the dachshund's German roots, you can find hints of his original purpose in his name. Dachs refers to "badger" and hund means "dog" in German, so it's easy to see why he was used to hunt and kill badgers hundreds of years ago. His canine ancestry isn't known for sure, though early versions of the dachshund likely included the French pointer, pinscher, spaniels and a German gun dog, known as a stoberhund. 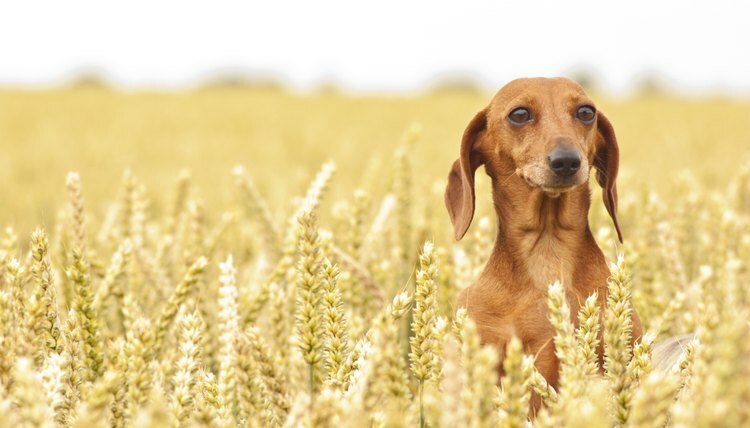 During the past 100-plus years, the dachshund has been refined by breeding a variety of dogs; breeds that have helped bring the dachshund to its current stature include include the German wirehaired pinscher, Dandie Dinmont terrier, toy terriers and pinschers, miniature pinscher, papillon, miniature pinscher and miniature schnauzer. The dachshund of today comes in two sizes, the miniature and standard, according to the American Kennel Club. The standard is a bruiser compared to his smaller cousin, standing up to 10 inches tall and weighing between 16 and 32 pounds. When you look at the miniature dachshund head-on, you'll see his front legs appear crooked, however that's because his wrists are closer together than his shoulder joints. While his body is built for tunneling, his jaws are strong to catch and hold prey and he has a keen nose that sniffs out all manner of quarry. He has three coat types: smooth, longhaired and wirehaired, each with its own advantages. The smooth coat provides protection against the elements; the sleek, longhaired coat provides more durability and the wirehaired coat sports tight, thick, hard hair with a fine undercoat for superior protection. Today's miniature dachshund has little need to hunt badgers, but he's still game for adventure. For him, that may mean digging, tracking and playing. He's strong-willed, so training him to understand you're the boss is important. Miniature dachshunds have a greater tendency to be more timid than their larger relatives. Longhaired dachshunds may be quieter, given they have less terrier in their bloodlines. Wirehaired doxies tend to be the most outgoing of the dachshunds. Generally, you can expect a playful, high energy dog when you open your home to a miniature dachshund. The dachshund's unique build puts him at risk for some special stress on his back and intervertebral disks, including prolapsed disk. Keeping a miniature dachshund at a healthy weight minimizes his risk of intervertebral disease. He's prone to ear infections because of his drop ears and some are born deaf. Dry eye, epilepsy, diabetes and patellar luxation are minor health concerns. The longhaired and wirehaired versions require twice-weekly brushing, particularly if they're able to run through the woods or other areas where they can pick up burrs. A healthy miniature dachshund can expect to live between 12 and 14 years.